Evian is not just a bottled water company. And the town of Évian-les-Baines in France on the south shore of Lake Geneva is not just a location for luxury hotels. It’s also the location where, in July 1938, the first international effort was ever made (or feigned) to alleviate a refugee crisis. The crisis was the Nazi treatment of Jews. The representatives of 32 nations and 63 organizations (plus some 200 journalists covering the event) were well aware of the Nazis’ desire to expel all Jews from Germany and Austria, and somewhat aware that the fate that awaited them if not expelled was death. The decision of the conference was essentially to leave the Jews to their fate. (Only Costa Rica and the Dominican Republic increased their immigration quotas.) The decision to abandon the Jews was driven primarily by anti-Semitism, which was widespread among the diplomats in attendance and among the publics they represented. These nations were represented at the Évian Conference: Australia, the Argentine Republic, Belgium, Bolivia, Brazil, United Kingdom, Canada, Chile, Colombia, Costa Rica, Cuba, Denmark, Dominican Republic, Ecuador, France, Guatemala, Haiti, Honduras, Ireland, Mexico, the Netherlands, New Zealand, Nicaragua, Norway, Panama, Paraguay, Peru, Sweden, Switzerland, the United States, Uruguay, and Venezuela. Italy refused to attend. The dictator of the Dominican Republic viewed Jews as racially desirable, as bringing whiteness to a land with many people of African descent. Land was set aside for 100,000 Jews, but fewer than 1,000 ever arrived. In The Jewish Trail of Tears The Evian Conference of July 1938, Dennis Ross Laffer concludes that the conference was set up to fail and put on for show. Certainly it was proposed by and chaired by a representative of U.S. President Franklin Roosevelt who chose not to make any serious efforts to aid Jewish refugees, before, during, or after the conference. Of course, with German expansion in the years ahead, the number of Jews and non-Jews subject to murder by the Nazis would grow to much more than 17,000 times 32. 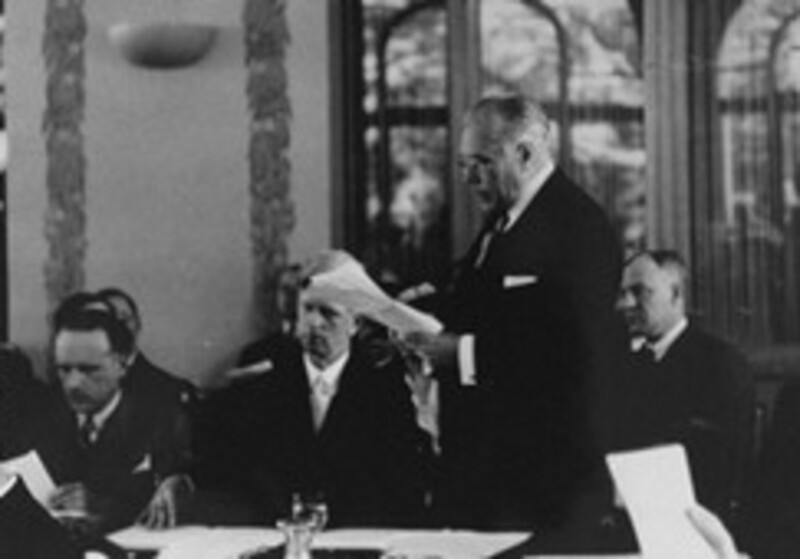 A report suggests that “the fact that the Evian Conference did not pass a resolution condemning the German treatment of Jews was widely used in Nazi propaganda and further emboldened Hitler in his assault on European Jewry leaving them ultimately subject to Hitler’s ‘Final Solution to the Jewish Question.’” The U.S. Congress also failed to pass such a resolution. ‘1. “We,” that is the democracies, “are not in a position to take in the Jews.” Yet in these empires there are not even ten people to the square kilometer. While Germany, with her 135 inhabitants to the square kilometer, is supposed to have room for them! The idea that the problem at Évian was ignorance of the Nazi agenda — were any scholar to make such an argument — would be undone by the minutes of the Bermuda Conference of 1943, held when government officials certainly knew about the genocide underway. The outcome of that conference, held by the U.S. and U.K. was the same as the one at Évian. “In accordance with their democratic ideology and political tendencies, the official statements made by the representatives of the United States, France and – to a lesser degree – England, made noises of moral outrage over the liquidation of the Jewish problem in Germany. At the same time, however, England and France were so reserved when it came to declaring readiness to accept more emigrants, that the representatives of other states, who did not wish to speak out at all at the outset, found the courage to express one after the other their reluctance to permit new Jewish emigration. “The European countries did this, while pointing to the fact that they had reached the point of saturation; the south Americans spoke unanimously of the agricultural structure of their countries which permitted the emigration of farmers, not of merchants and city intellectuals. Some of them, as for example the representative of Brazil, let it be understood that Jews often would enter disguised as farmers, only to move to the city at the earliest opportunity. Jessie Wallace Hughan, founder of the War Resisters League, was, as Lawrence Wittner tells us, very concerned in 1942 by stories of Nazi plans, no longer focused on expelling Jews but turning toward plans to murder them. Hughan believed that such a development appeared “natural, from their pathological point of view,” and that it might really be acted upon if World War II continued. “It seems that the only way to save thousands and perhaps millions of European Jews from destruction,” she wrote, “would be for our government to broadcast the promise” of an “armistice on condition that the European minorities are not molested any further. . . . It would be very terrible if six months from now we should find that this threat has literally come to pass without our making even a gesture to prevent it.” When her predictions were fulfilled only too well by 1943, she wrote to the U.S. State Department and the New York Times: “two million [Jews] have already died” and “two million more will be killed by the end of the war.” She warned that military successes against Germany would just result in further scapegoating of Jews. “Victory will not save them, for dead men cannot be liberated,” she wrote. And to repeat it, endlessly. U.S. and Western immigration policy is an extended Évian Conference. Only it’s worse. Now the U.S. and its allies are significantly responsible for many of the horrors the refugees are fleeing. But the bogeyman Fox News warns of is not enormous suffering in Yemen or Syria. It’s open borders. Meanwhile, the most common justification for the military spending and the wars that create the crises is, of course, Adolf Hitler.